Roman Imperial Coinage (RIC) is pretty much essential once you become more than a casual collector of Roman Imperial Coinage. It covers the period from 31BC to the end of the Roman Empire and each volume endeavoured to be an authoritative catalogue of coin types. 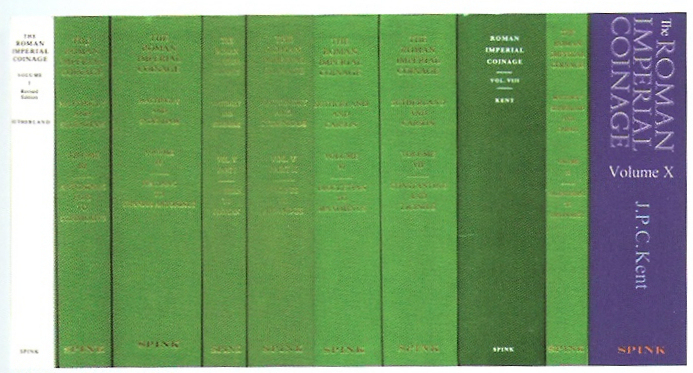 The first volume was issued in 1923 and the last (Volume X) in 1994. 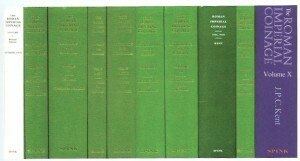 Some volumes have been revised since they were first published – Volume I and part of Volume II. The earlier volumes are now clearly out of date but they are still useful for the information they contain and because other references, for example dealer and auction catalogues will often quote RIC numbers. This is why original editions should be kept even when revised editions are published. I will update this list as further information about planned revisions becomes available. Volume I. From 31BC to AD69 Augustus to Vitellius. Revised edition by C.H.V. Sutherland. 1984. xxii + 305 pages + 32 plates. This revised volume replaced the original edition edited by H Mattingly and E A Sydenham and issued in 1923 (1st ed. 279 pages + 16 plates). The original version is still handy for tracking references. Volume II. Vespasian to Hadrian. H Mattingly and E A Sydenham. 1926. xvi + 568 pages + 16 plates. First published in 1926 and reprinted in 1986, 1989 and 1997. Now out of print and being replaced in two parts. The first part is described next and part two, which will simply be a straight reprint of the second half of the original, is awaited. Volume II Part 1. From AD 69 to AD 96 Vespasian to Domitian. I A Carradice and T V Buttrey. 2007. 2nd, fully revised edition. 427 pages + 160 plates. One of the new series of RIC. It follows the ideas of the first editions, but this is much revised, enlarged and improved and takes internet resources into account. Volume II Part 2. Forthcoming. Simply a reprint of the relevant parts of the original edition but the plates are said to be much superior. Volume III Antoninus Pius to Commodus. H A Mattingly and E A Sydenham. 1930. xviii + 514 pages + 16 plates. Another volume that is greatly out of date and is currently being revised although there is currently no planned publication date. First published in 1930 and reprinted in 1968, 1972, 1986, 1989, 1997. Volume IV. Part 1. Pertinax to Geta AD 193-212. H A Mattingly and E A Sydenham. 1936. xv + 399 pages + 16 plates. Reprinted in 1968 and 1972. Out of date. No further information regarding publication of revised edition. Volume IV Part 2. Macrinus to Pupienus. H A Mattingly, E A Sydenham and C H V Sutherland 1938 xi + 215 pages + 13 plates. Volume IV Part III. Gordian III to Uranius Antoninus. H A Mattingly, E A Sydenham and C H V Sutherland. 1949. xxiii + 246 pages + 16 plates. Reprinted in 1968. Out of date. No further information regarding publication of revised edition. All three parts of volume IV were reprinted in one volume in 1986, 1993 and 1998. Volume V Part 1. Valerian to the Interregnum. Percy H. Webb, edited by H A Mattingly and E A Sydenham. 1927. xiii + 424 pages +12 plates. Under the auspices of Sylviane Estiot and Jérôme Mairat, the database covers the period from 268 until 276 AD, that is, the reigns of Claudius Gothicus, Quintillus, Aurelian, Tacitus, Florianus, as well as the coinage of the princes of Palmyra, Vabalathus and Zenobia, issued by the imperial mint of Antioch. It is based on 12 main institutional collections of reference (Paris, London, Oxford, Vienna, Copenhagen, Milan, Budapest, Munich, Brussels, Cambridge, Berlin, New York) which have been exhaustively studied and digitized by agreement of their curators. The database holds to date more than 4540 entries, based on 104,000 coins and more than 80,000 digital photographs. Volume V Part 2. Probus to Amandus. Percy H. Webb, edited by H A Mattingly and E A Sydenham. 1933. xix + 701 pages +20 plates. Reprinted in 1998 and 2001. This volume includes the Carausius and Allectus issues and should be extremely useful for Romano-British specialists. Unfortunately it is so out of date as to be virtually useless by itself. It is currently being rewritten under the stewardship of Sam Moorhead of the British Museum and its appearance is greatly awaited. Volume VI. Diocletian’s Reform (AD294) to the Death of Maximinus (AD313). C H V Sutherland and R Carson. 1967 edition, reprinted 2003. xxiii + 727 pages + 16 plates. Indispensable for Romano-British specialists. Includes the first half of the London mint issues. Volume VII. Constantine and Licinius. A.D. 313 to 337. P M Bruun. 1966. xxxi + 778 pages + 24 plates. Indispensable for Romano-British specialists. Includes the latter half of the London mint issues. Original edition was with dust jacket, later reprint were casebound in green cloth without dust jacket. Reprinted in 1972, 1984, 1997 and 2003. Volume VIII. The Family of Constantine I AD 337-364 J P C Kent with C H V Sutherland and R A G Carson as editors. 1981. 656 pages + 28 plates. The coinage of the sons of Constantine the Great continues with little significant change, the monetary system established by their father, and is just as interesting. This volume covers the issues of Constantine II, 337-340; Constans, 337-350; Constantius II, 337-361; and of Magnentius,350-353; Decentius; Vetranio 350; Julian, 360-363; and Jovian 363-4. Volume IX. Valentinian I to Theodosius I. J.W.E. Pearce, edited by H A Mattingly, C H V Sutherland and R Carson. First published 1933. xliv + 334 + 16 plates. Again, quite out of date by now but nothing known of any planned replacement. Reprinted in 1968, 1972, 1988 and 1997. Volume X. The Divided Empire and the Fall of the Western Parts. R A G Carson, John P C Kent, and Andrew M Burnett. 1994 edition. 692 pages + 82 pl. One of the more recent volumes of the series and as such, takes account of the more recent research and finds.